ZIMBABWE – Ireland found Zimbabwe a much tougher opponent in Dharamsala on Saturday afternoon falling to a six wicket defeat in their second and final World T20 warm-up match. Paul Stirling returned to his regular opening spot having sat out Thursday’s big win over Hong Kong and he and William Porterfield gave their side a solid start as Ireland batted first on a track which offered early assistance to the bowlers. Stirling was his belligerent self with a couple of big sixes in his 9-ball cameo of 14 while the skipper looked in good touch following his unbeaten 75 earlier in the week. Gary Wilson joined Porterfield after Stirling went and these two took the score to 70 before the Warwickshire man was dismissed for 31 (4 fours and a six). 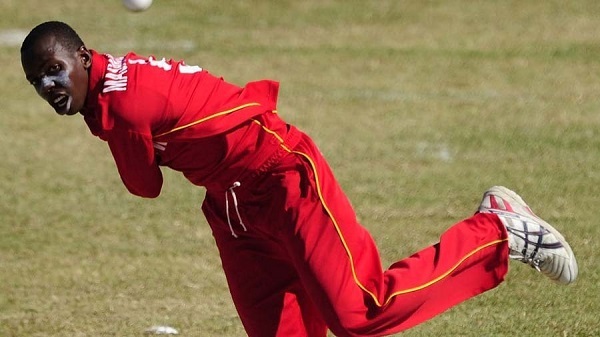 That breakthrough seemed to spur Zimbabwe on and former Strabane professional Tawanda Mupariwa led the way as Ireland’s middle order struggled. Wilson timed the ball with increasing fluency throughout his innings, and was perhaps unlucky to be well caught on the leg-side boundary following an improvised shot which look destined to clear the ropes. Mupariwa (2-36), Tendai Chatara (2-33), Sean Williams (1-19), Wellington Mazakadza (1-19) and Donald Tiripano (1-20) were all on the mark and it needed a couple of late cameos from Tim Murtagh (13*) and George Dockrell (13), aided by 24 extras to get the Irish total up to 155 for 8. The classy Hamilton Masakadza gave the Zimbabwe reply real momentum as he and Vusi Sabanda knocked 46 off the target before the latter was bowled by Boyd Rankin, playing on for 18. Masakadza and Richmond Mutumbami then took the match away from Ireland with a 75-run stand and although Kevin O’Brien did for Mutumbami (29- 5 fours and a six), Zimbabwe were in control from there on. The Irish attack struck to their task manfully, but Mazakadza was able to find boundaries at crucial times, which eased any pressure Ireland were able to accumlate. Malcolm Waller (16) chipped in to the victory but it was Masakadza who held all the aces, as the track dried slightly and became easier to bat on as the game progressed. The Zimbabwean skipper’s unbeaten 68 came off 49 balls and included 3 fours and 6 sixes and was the difference between the sides on the day. It’s down to the real business for Porterfield’s men now and Ireland will look to get back to winning ways against Oman on Wednesday when the tournament starts in earnest. At Dharamsala, Zimbabwe beat Ireland by 6 wickets.